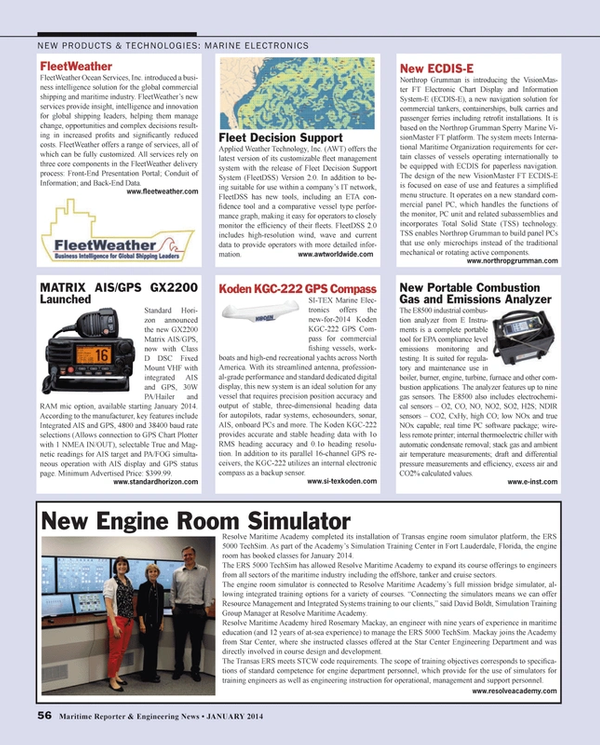 Resolve Maritime Academy completed its installation of Transas engine room simulator platform, the ERS 5000 TechSim. As part of the Academy’s Simulation Training Center in Fort Lauderdale, Florida, the engine room has booked classes for January 2014. The ERS 5000 TechSim has allowed Resolve Maritime Academy to expand its course offerings to engineers from all sectors of the maritime industry including the offshore, tanker and cruise sectors. The engine room simulator is connected to Resolve Maritime Academy’s full mission bridge simulator, allowing integrated training options for a variety of courses. “Connecting the simulators means we can offer Resource Management and Integrated Systems training to our clients,” said David Boldt, Simulation Training Group Manager at Resolve Maritime Academy. Resolve Maritime Academy hired Rosemary Mackay, an engineer with nine years of experience in maritime education (and 12 years of at-sea experience) to manage the ERS 5000 TechSim. Mackay joins the Academy from Star Center, where she instructed classes offered at the Star Center Engineering Department and was directly involved in course design and development. The Transas ERS meets STCW code requirements. The scope of training objectives corresponds to specifications of standard competence for engine department personnel, which provide for the use of simulators for training engineers as well as engineering instruction for operational, management and support personnel.